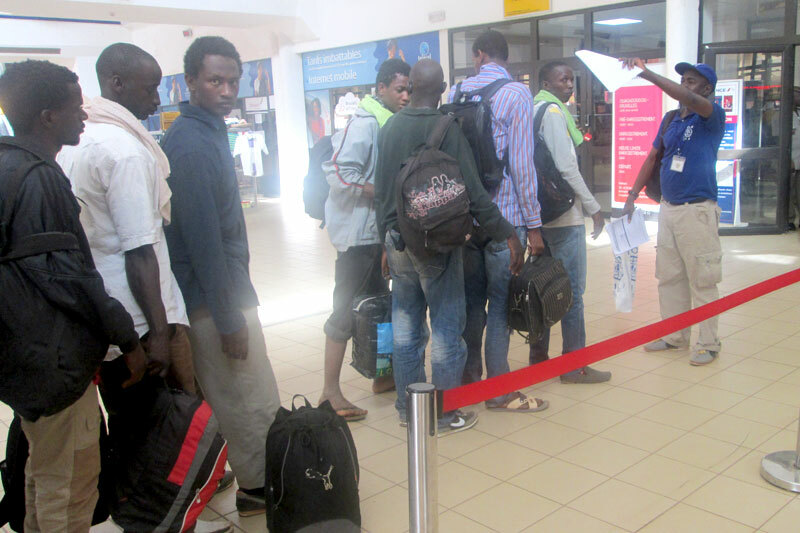 Burkina Faso - On March 2nd 2016, the IOM Country Office in Burkina Faso provided return assistance to 19 Senegalese migrants in transit from Niger. Most of them were stranded in Niger and requested assistance to return to their country of origin. This operation was initiated by the IOM Country Office in Niger. Due to the strike of air traffic controllers in Niamey, the migrants had to cross the Burkinabe border to leave from the Ouagadougou airport. They traveled by car from Niamey to Ouagadougou and were escorted by IOM. For their transit in Ouagadougou, the IOM Country Office in Burkina Faso received the migrants at the 3STV bus station; they were then transported to Ouagadougou International Airport where they took a plane to Senegal. Their transit in Burkina Faso was facilitated by the collaboration between IOM Burkina Faso and the Burkinabe authorities including the airport police and the border police. With their help, the 19 migrants were able to transit in Burkina Faso without difficulties despite the delays on the route caused by multiple checkpoints due to the measures taken against terrorism. The migrants were able to return safely to Senegal, with the help of the IOM Country Offices in Niger and Burkina Faso under the coordination of the Regional Office in Dakar.